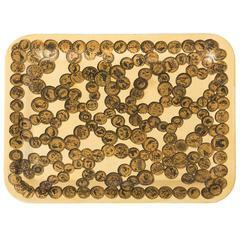 A Piero Fornasetti tray. “Sole”. Lithographically printed. Hand colored and gilt highlighted on white ground. Metal. Italy, circa 1960. Measures: 39.5 cm diameter x 3 cm high. A Piero Fornasetti tray “Sole” Lithographically printed. Hand colored and gilt highlighted on red ground. Metal. Italy, circa 1960 Measures: 39.5 cm diameter. 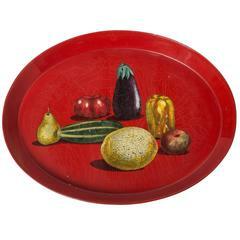 A rare early tray by Piero Fornasetti. “Monete” Rectangular form. Metal, lithographically printed, highlighted in gold, Italy, circa 1950. Measures: 58.5 cm x 47 cm. 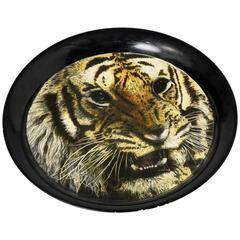 A Piero Fornasetti tray of circular form “Tigre” Lithographically printed and hand colored metal. Italy, circa 1960 Measure: 40 cm diameter. Stunning Fornasetti serving tray featuring an adorned dress arm holding an antique glass. Label on the back. Very rare original Piero Fornasetti oval tray, Italy, circa 1950, metal, lacquered, signed with old Fornasetti sticker and included a Lucite stand Measures: H 4 x 45 B x 34 D cm.